If someone had stumbled upon Katydid Farm in Windsor one sunny day in late March they might have thought they had gone back in time. There was a splendid array of horses, beautiful carriages and attractively dressed men and women. A time warp in Aiken? No, it was the 12th annual Sporting Day of Traditional Driving. The purpose of a Sporting Day of Traditional Driving is to preserve and celebrate the carriage-driving style of bygone days, which encompasses horsemanship, driving acumen, care and preservation of carriage and harness, and the intangible qualities of good sportsmanship. The Sporting Day focuses on traditional driving and includes three phases: a turnout inspection, a country drive, and the cones course. All types of carriages are accepted, but antique vehicles or traditional reproductions of the same are preferred. In the same vein, traditional leather harness that is appropriate to the vehicle is preferred over synthetic harness. Although intended more as a celebration of traditional driving than as a competition, the Sporting Day of Traditional Driving does contain competitive elements. Each turnout is competing against an ideal, rather than against the other turnouts in attendance. The optimum score of 100 is broken down among the three phases as follows: a possible 50 points for the turnout inspection, 25 for the country drive, and 25 for the cones course. "This is an event that has certainly grown over the past few years," says Peggy Dils, who is the president of the Aiken Driving Club, which is the organization that sponsors the event. "I think people are looking back at the tradition of driving and rediscovering the roots of the sport. When drivers discover how much fun the Sporting Day is they really come out and support it." Jane Simmons competed Riggs, her mini, and took first prize in her division, the VSEs (very small equine). "I was very pleased with our result, especially with how well Riggs did on the country drive (the marathon course that was a bit more than five miles). We live out in Hopeland Farms and I put a lot of miles on Riggs going back and forth on Implement Road – but it paid off for us," Jane says. "There were several four-in hand entries and they were just exquisite." Katrina Becker won the top prize with her four-in-hand, while Peggy Keeler was the overall winner. "The Sporting Day of Traditional Driving is the one event in driving where the horse is not the major player. 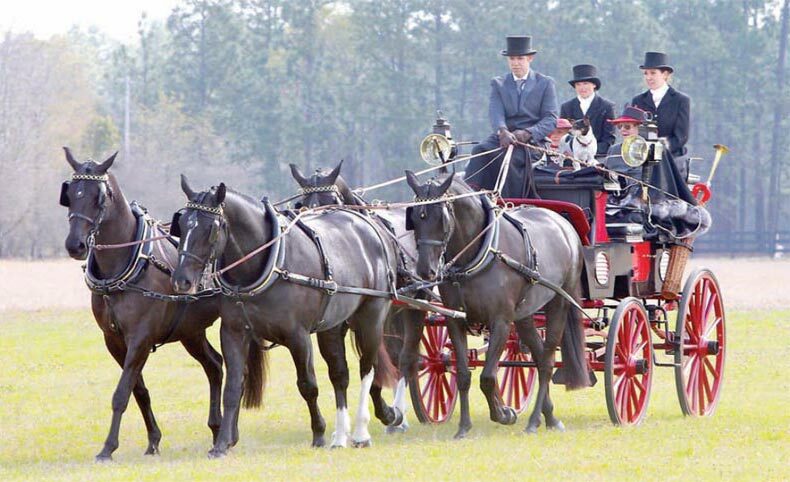 It’s about the driver, carriage and harness," says Pixie Baxter, who is a recent past president of the Aiken Driving Club. "It's a day to celebrate driving the way it was two centuries ago. When you see the carriages (and some are true antiques) and beautiful harnesses it really takes your breath away. You know that the drivers have taken the time to be meticulous about everything – from the braiding to the brass being polished." "I think events like this one are growing because there is a cultural shift in our country – people are realizing that when something is done well – no matter if it's the perfect note of a trumpet, the cut of a dress, or a horse, carriage and driver that are immaculately presented – it brings pleasure," adds Pixie.